"Standardize" redirects here. For industrial and technical standards, see Standardization. For Fisher z-transformation in statistics, see Fisher transformation. For Z-values in ecology, see Z-value. For z-transformation to complex number domain, see Z-transform. For Z-factor in high-throughput screening, see Z-factor. For Z-score financial analysis tool, see Altman Z-score. It is calculated by subtracting the population mean from an individual raw score and then dividing the difference by the population standard deviation. It is a dimensionless quantity. This conversion process is called standardizing or normalizing (however, "normalizing" can refer to many types of ratios; see normalization for more). Standard scores are also called z-values, z-scores, normal scores, and standardized variables. They are most frequently used to compare an observation to a theoretical deviate, such as a standard normal deviate. Computing a z-score requires knowing the mean and standard deviation of the complete population to which a data point belongs; if one only has a sample of observations from the population, then the analogous computation with sample mean and sample standard deviation yields the t-statistic. μ is the mean of the population. The absolute value of z represents the distance between the raw score and the population mean in units of the standard deviation. z is negative when the raw score is below the mean, positive when above. Calculating z using this formula requires the population mean and the population standard deviation, not the sample mean or sample deviation. But knowing the true mean and standard deviation of a population is often unrealistic except in cases such as standardized testing, where the entire population is measured. 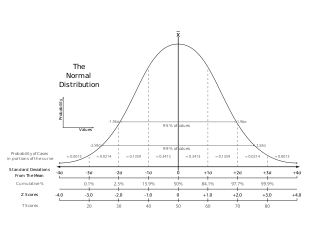 When the population mean and the population standard deviation are unknown, the standard score may be calculated using the sample mean and sample standard deviation as estimates of the population values. is the mean of the sample. The z-score is often used in the z-test in standardized testing – the analog of the Student's t-test for a population whose parameters are known, rather than estimated. As it is very unusual to know the entire population, the t-test is much more widely used. In process control applications, the Z value provides an assessment of how off-target a process is operating. When scores are measured on different scales, they may be converted to z-scores to aid comparison. give the following example comparing student scores on the SAT and ACT high school tests. The table shows the mean and standard deviation for total score on the SAT and ACT. Suppose that student A scored 1800 on the SAT, and student B scored 24 on the ACT. Which student performed better relative to other test-takers? Because student A has a higher z-score than student B, student A performed better compared to other test-takers than did student B. Continuing the example of ACT and SAT scores, if it can be further assumed that both ACT and SAT scores are normally distributed (which is approximately correct), then the z-scores may be used to calculate the percentage of test-takers who received lower scores than students A and B. "For some multivariate techniques such as multidimensional scaling and cluster analysis, the concept of distance between the units in the data is often of considerable interest and importance … When the variables in a multivariate data set are on different scales, it makes more sense to calculate the distances after some form of standardization." In principal components analysis, "Variables measured on different scales or on a common scale with widely differing ranges are often standardized." Standardization of variables prior to multiple regression analysis is sometimes used as an aid to interpretation. (page 95) state the following. "The standardized regression slope is the slope in the regression equation if X and Y are standardized… Standardization of X and Y is done by subtracting the respective means from each set of observations and dividing by the respective standard deviations… In multiple regression, where several X variables are used, the standardized regression coefficients quantify the relative contribution of each X variable." However, Kutner et al. (p 278) give the following caveat: "… one must be cautious about interpreting any regression coefficients, whether standardized or not. The reason is that when the predictor variables are correlated among themselves, … the regression coefficients are affected by the other predictor variables in the model … The magnitudes of the standardized regression coefficients are affected not only by the presence of correlations among the predictor variables but also by the spacings of the observations on each of these variables. Sometimes these spacings may be quite arbitrary. Hence, it is ordinarily not wise to interpret the magnitudes of standardized regression coefficients as reflecting the comparative importance of the predictor variables." "T-score" redirects here. It is not to be confused with t-statistic. In educational assessment, T-score is a standard score Z shifted and scaled to have a mean of 50 and a standard deviation of 10. In bone density measurements, the T-score is the standard score of the measurement compared to the population of healthy 30-year-old adults. ^ E. Kreyszig (1979). Advanced Engineering Mathematics (Fourth ed.). Wiley. p. 880, eq. 5. ISBN 0-471-02140-7. ^ E. Kreyszig (1979). Advanced Engineering Mathematics (Fourth ed.). Wiley. p. 880, eq. 6. ISBN 0-471-02140-7. ^ John Salvia; James Ysseldyke; Sara Witmer (29 January 2009). Assessment: In Special and Inclusive Education. Cengage Learning. pp. 43–. ISBN 0-547-13437-1. ^ Edward S. Neukrug; R. Charles Fawcett (1 January 2014). Essentials of Testing and Assessment: A Practical Guide for Counselors, Social Workers, and Psychologists. Cengage Learning. pp. 133–. ISBN 978-1-305-16183-2. ^ Randy W. Kamphaus (16 August 2005). Clinical Assessment of Child and Adolescent Intelligence. Springer. pp. 123–. ISBN 978-0-387-26299-4. ^ "Bone Mass Measurement: What the Numbers Mean". NIH Osteoporosis and Related Bone Diseases National Resource Center. National Institute of Health. Retrieved 5 August 2017. Carroll, Susan Rovezzi; Carroll, David J. (2002). Statistics Made Simple for School Leaders (illustrated ed.). Rowman & Littlefield. ISBN 978-0-8108-4322-6. Retrieved 7 June 2009. Larsen, Richard J.; Marx, Morris L. (2000). An Introduction to Mathematical Statistics and Its Applications (Third ed.). p. 282. ISBN 0-13-922303-7.